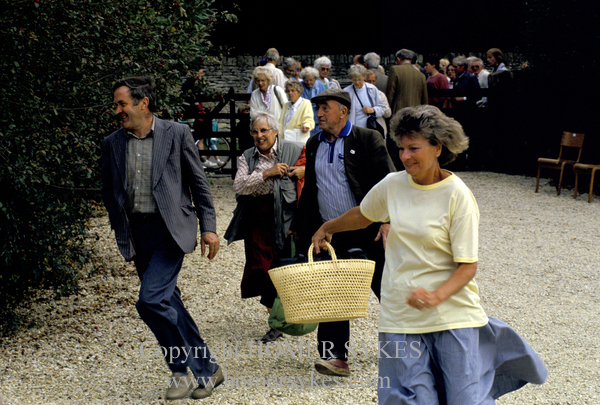 White elephants, monster marrows – the village fete has a formula that seldom varies. But it’s quintessential to the British summer. 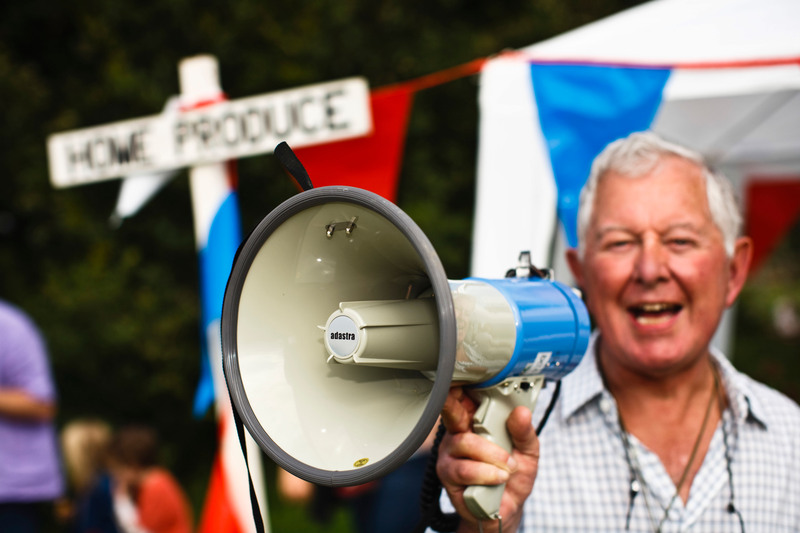 BRIAN SOUTER MAKING ANNOUNCEMENTS AT THE EASTLEACH VILLAGE FETE. Special? Well, it’s very old , mentioned in the Doomsday Book. And the village is very beautiful, sitting snugly on the lovely River Leach that ambles so aimlessly. Two Norman churches face each other across the water, and radiating outwards from them are the houses in quiet Cotswold stone, their gardens wild, wonderful mixes of flowers and vegetables tumbling up and down slopes. Eastleach Turville isn’t great on manicured lawns and regimented flowerbeds. 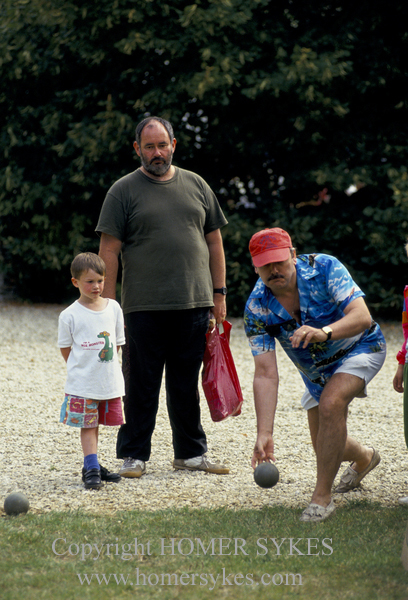 The fete is special, too , a rich razzmatazz of tombola, raffle, white elephant, cake stall, skittles, vegetable contests and bran tubs, all garnished with a lethal dice game run by Martin Squire, son of a former vicar. A CROWD AROUND THE WHITE ELEPHANT STALL. Nobody knows when it began, but they know Eastleach Turville would be a poorer place without it. 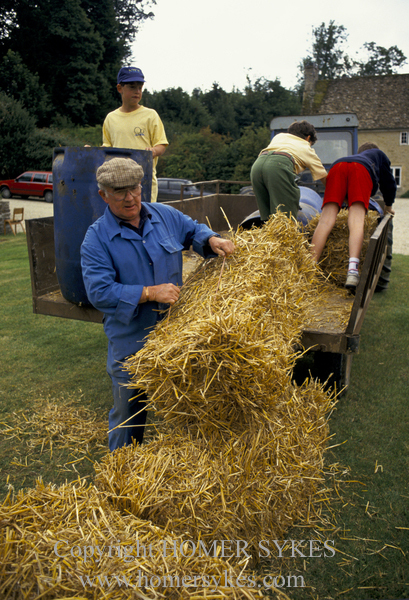 In the first place it gives villagers an opportunity to relax together – never easy in an increasingly workaday world. But more importantly, perhaps, it helps newcomers blend easily into the ancient rhythm of the place. That has been Derek Edward’s experience, anyway. He came to the village four years ago, having retired at the age of 56 from a senior post with Coutaulds. A year later he found himself organising the fete. “Another retired businessman has just finished three years as organiser and asked me if I’d take over, “ says Derek. The village fete, he learned quickly , is scarcely the commercial jungle in which he had lived for so long. “Like the coronation, it has a formula which seldom changes,” he says. 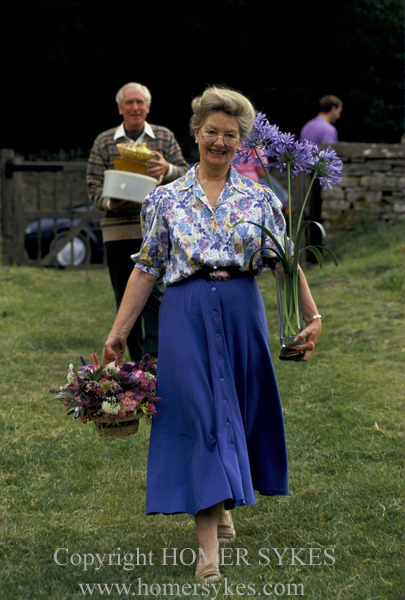 There’s nothing so grand or time-consuming as a committee – just a meeting early in the year with a few key people.Graham Tonge and Preston Jones organise a vegetable and flower, cake and craft show which gives the proceedings a nice rusty edge of competition. It is for villagers only. The entrance fee is 25p for adults and 10p for children, who have special competition categories of their own – best veggie animal, best edible necklace, best handwriting, best picture of Eastleach. EDWARD ARKELL WITH HIS ENTRY FOR THE STRANGE VEGETABLE ANIMALS COMPETITION. MRS RICHARDS BRINGS TO THE FETE HER ENTRY IN THE FLOWER ARRANGING COMPETITION. 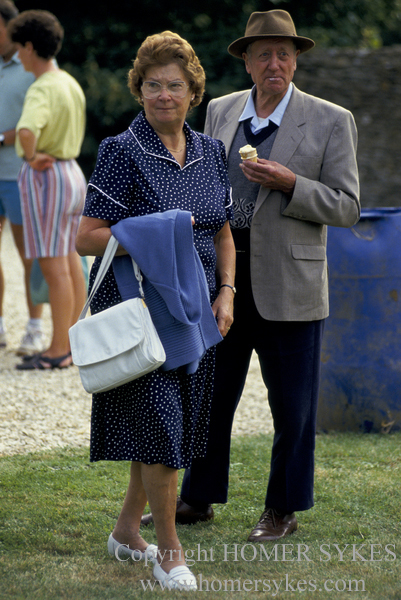 COUPLE SPEND THE AFTERNOON AT THE FETE. Twenty-four hours before the show, a team of helpers materialises to transfer tables, chairs and crockery from the village hall to the grounds of Bouthrop House, the show site for the last 12 years. 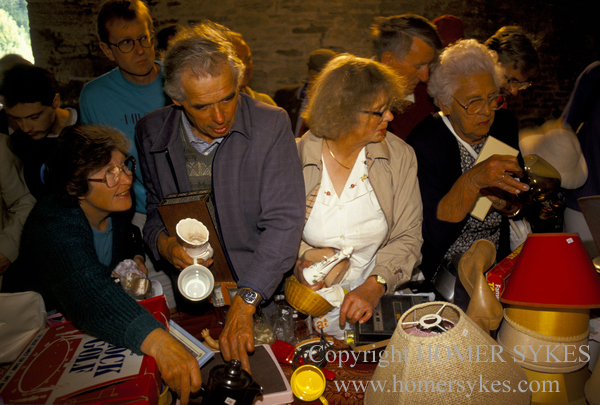 Then a convoy moves from the village, collecting last minute donations of cakes and jams for the stalls, bottles of booze for the tombola and anonymous fodder for the white elephant. Down at Bridge Cottage by the river Graham Tonge and Preston Jones are receiving entries for their competitions, they they are not yet inundated. Behind closed doors all over the village people are busy. Mary Jenkins, 47 years in Eastleach Turville, is baking her entry for the best chocolate cake contest. Not far away Trish Haynes, treasurer of the village hall committee, has completed two flower arrangements for the show and is working on a third for the “My Garden” section – a cluster of yellow flowers garnished with gardening gloves, a trowel and a size nine boot. Trish has a special claim on Eastleach Turville. Her Great-Grandfather quarried the stone to build the house in which she lives. Her Grandfather was born there. So was her mother. And so was Trish, who ran the post office until lack of business closed it. Meanwhile, Albert Waring, 74 years old (30 years in the village) and scion of the gardening club, is throwing a quietly confident eye over his entries for the dahlia section. He has has a few jobs in his time, Alert: farm worker, soldierm security man. Ansd he is still working, gardening for Mary Jenkinson, keeping the village tidy for the parish council and, as a hobby producing and endless stream of suberb flowers and vegetables. 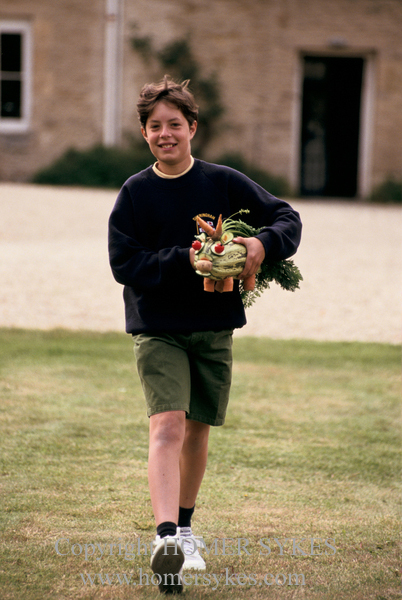 ” I had an open day for the gardening club a while back, “ he says. Albert is happy with his dahlias. Buy up the road Albert Tye is equally happy with his. And so is Arthurs wife, Francis, who has her own patch. When it comes to flowers on fete day, marriage lines slacken. Competitors insist they enter for fun, but behind compost heaps rivalries flourish. Even Derek Edwards is not immune. Before he came to Eastleach he had never grown even a weed. Now he is pitting his onions against all-comers. But there are no certainties here, except, perhaps, Braham Berry’s entry in the Monster Marrow Megathon. Graham is one of three generations of Berry’s in the village and his wife, Winnie, has created one of its finest gardens. His marrows are legends. PREPARATION OF THE BOWLING ALLEY FOR THE FETE. 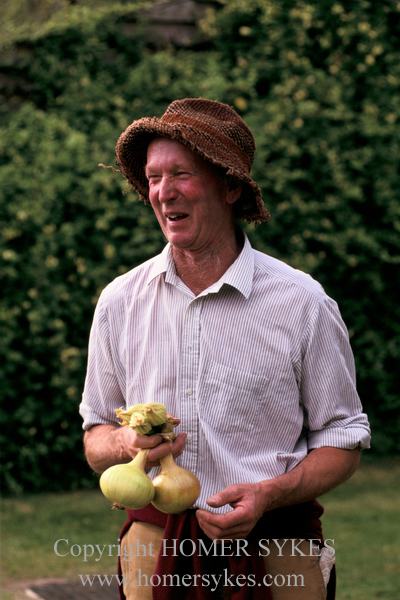 MARTIN SQUIRES, A LOCAL FARMER WITH HIS BEST ONIONS SELECTED FOR THE COMPETITION. Early on the morning of the show the sun slides obediently into the sky and stallholders move into their final reflex routines. Megan Stewart and Audrdey Evans are pricing the cakes for their stall, apple cake, almond sponge, lemon drizzle cake, gooey Quaker Oats fingers, fruit cake, homey loaf. Even the labels are fattening.